← Wach Auf and Smell the Coffee! A very different tack is taken on “Wach auf!” by Norway’s Maja Ratkje with POING. Ratkje is most familiar to those outside Norway through her projects using extreme vocal techniques and manipulations with electronics, but she also has extensive experience writing operas, chamber pieces and compositions for all manners of large ensemble. What’s most notable about her tone on this record is how tangibly she invokes the mood of a Brechtian political cabaret, alternating between swagger, softness, snarl and lust. 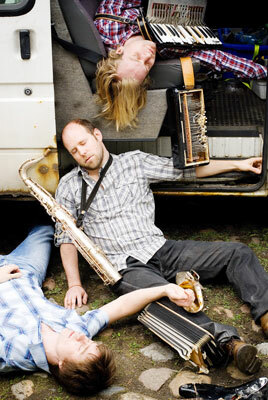 The record documents a twelve year collaboration-in-progress between Ratkje and POING (Frode Haltli on accordion, harmonium, bass trombone and vocals, Rolf-Erik Nystrøm on saxes and vocals, Håkon Thelin on doublebass and vocals) as they investigate and update revolutionary music from around the world. A lot of the tunes reworked here are of the Brecht/ Weill/ Eisler era, with Ratkje’s keenly articulated German insinuating you into that very distinct atmosphere. But this project isn’t about recreation; it is about enlivening these works for new times, which they do to viscerally sharp effect on “Sangen om Mandelay.” It starts with rapid bursts and gorgeous accordion runs, with all the necessary aggression, then Ratkje switches into dulcet quivering and gradually the band blisters into a kaleidoscopic improv; they then switch back to the whipping and wheezing of the final verse before capping it all off with a joyful klezmer dance number. It works because all the performers display a high level of comfort with all the diverse cultural references, and because they possess the technical facility to channel that comfort into compelling song. Punctuating the rest of the album are traditional Norwegian radical songs, a couple of national anthems for now-defunct countries (the GDR, USSR), Cyndi Lauper’s “True Colors” and some very brief, very volcanic reinterpretations of Minor Threat’s “Seeing Red.” The Lauper in particular I find quite poignant, as Nystrøm’s soprano sax oh-so-tenderly traces the melody in the air like a declaration of love spelled out in the sky in puffy clouds. And in the context of revolutionary music that surrounds it, “True Colors” comes across as a way to refract the nationalist impulse to codify individual colors and arrangements of colors – whether in flags or in movements – into the more accurate realm of emotional understanding: “true” colors. Also of special note is the setting of the traditional Norwegian song about a street kid, “Gategutt,” to the tune of Mingus’ “Fables of Faubus” – an intuitively astute combination that gorgeously and engagingly blends righteous political music from across the globe.